Learn how to set up the Chalk WordPress theme. Chalk supports 9 post formats, selectable from the Edit Post screen: Standard (text), Aside (to-do list), Gallery, Link, Quote, Status, Video, Audio and Chat. Whenever you create a new post, choose an appropriate post format and follow the instructions below. 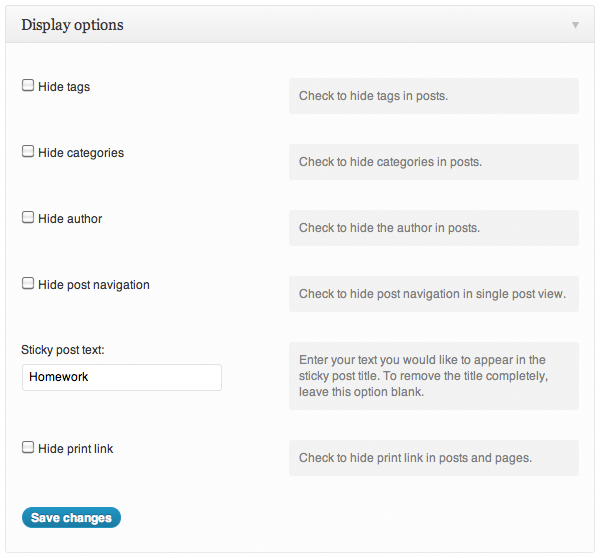 Articles work just like regular WordPress posts, leave the post format set to Standard and create your post. Select Aside from the post format box. Then, create an unordered list. Separate each task into a new list item by pressing enter/return on your keyboard. To mark a task as complete, highlight the text of a particular list item, then apply the Strikethrough styling (as shown below). This post format is not intended to display images and other typographic elements. Upload your image files via the Add Media icon. Customize your gallery settings (optional). Your images will now show using Chalk’s native slideshow display. The post title and meta will not display, only the gallery you created will be shown. Would you like to autostart your gallery? If yes, please read through the section of this theme’s documentation about enabling gallery autostart. Of course, you can also use the default WordPress gallery in the Standard post format. This post format will not display a Featured Image. Select Link from the post format box and type your link title into the post content editor. Next, highlight the text you just entered, and create your link by clicking the link icon in the editor. The post title will be ignored; only the linked text you entered will be shown. Select Quote from the post format box and type or paste your quote into the post content editor. Your quote will now display using Chalk’s custom Quote post format styling. The post title will not display, only the quoted text you enter will be shown. Select Status from the post format box and type a brief message into the post content editor. Your status update will now display using Chalk’s custom Status post format styling. The post title will not display, only the text you enter will be shown. Select Video from the post format box. Paste your embed code into the post content area. The post title and meta will not display, only the video you embed will be shown. Select Audio from the post format box. Then, upload your audio files via the upload media icon at the top of your post editor. 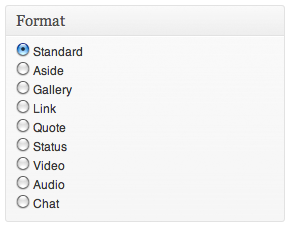 You may also add a description for your audio files in the post content area. If you choose to upload multiple audio files, a playlist will automatically be created. Select Chat from the post format box. Then, create an unordered list. Separate each line of dialogue into a new list item by pressing enter/return on your keyboard. Your conversation will now display using Chalk’s native chat styling. Chalk features a number of custom styles that will make your content stand out even further. Below are instructions for adding these custom styles to your content. This styling is not intended to for long bodies of text. Using the regular [gallery] shortcode will remove the slider styling and return to the default WordPress gallery. Chalk has three available page layouts, including the Default, Archives and Sitemap templates. In your WordPress dashboard, navigate to Pages → Add New and select one of the three templates available from the Template drop-down; your content will be formatted accordingly. The Archives and Sitemap pages on the demo site are created using the corresponding page templates. 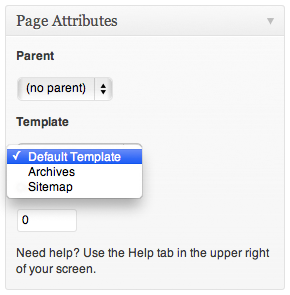 Select “Archives” or “Sitemap” from the Template drop-down to set the specifically formatted display for these page types. Create an image with dimensions of 760 x 300 pixels or larger. Set a Featured Image within your desired post. Not sure how your Featured Image should look? Take a look at this example on the demo site. In your WordPress dashboard, navigate to Appearance → Background. This will display the options available for adding a custom Background Image and/or Background Color. In your WordPress dashboard, navigate to the Appearance → Theme Options page. Under the “Fonts & Colors” section, enter your Primary and/or Secondary color value into the corresponding input fields, or feel free to use the color pickers for convenience. In your WordPress dashboard, navigate to the Appearance → Theme Options page. Under the “Fonts & Colors” section, there are two options for controlling the font families used across your theme. The Accent font is used for headings, block quotes, buttons, menus and other highlighted areas. The Body font is used for your post copy and all other content that is not styled by the Accent font. Chalk allows you to easily remove the author’s name, post navigation, print link, tags and categories from the post display. In your WordPress dashboard, navigate to the Appearance → Theme Options page. Under the “Display options” section, check the appropriate options to prevent them from displaying on all posts and pages. Your sharing buttons are controlled under the “Footer” section of the Appearance → Theme Options page. To disable all footer icons (including RSS), check “Disable all icons”. The input field for your footer Copyright text is found above the sharing options, under the “Footer” section of the Appearance → Theme Options page. By default, this is left empty. Where a height is not provided, feel free to insert your own custom value. Copyright © 2008 - 2019 Jestro LLC. The Theme Foundry® is a registered trademark. We also make simple WordPress membership software.